I have a pair of big ear-can headphones: the Sony MDR-7506, acquired used on Craigslist last year. I haven’t used headphones this big since… wow, since high school. …well, actually, it broke pretty quickly, as did its replacement. But soon the market responded with cheap knock-offs with sound every bit as good as Sony’s. A few years later, along came earbuds, which became the must-have audio accessory once the iPod debuted. Wonderful for most people, but hellish for me because I couldn’t figure out how to use them properly. They kept falling out, and I started to feel increasingly stupid at not being able to grasp this simple technology. Then David Pogue saved me with a column revealing I wasn’t alone. He and I and lots of other people lack a little nub of ear cartilage known as the antitragus which, for most of the world, holds those earbuds in snugly. It took me a few years after that to finally shell out for the big ol’ headphones of my youth, but I did and I’m happy. The kids are finally at an age where me isolating myself with a little music isn’t going to threaten anyone’s safety. And they’ve grown up on much smaller headphones, so neither one is pestering me to use these. Truth be told, they’re heavy and inconvenient, and I actually prefer to wear a lightweight pair of cheap off-brand Bluetooth headphones for day-to-day use. But when I want to disappear into a cocoon of sound, there’s nothing like two 1970s-style ear-mattresses to do the trick. Flight attendants, cross-check doors and body-check passengers for departure. The last week or two has brought a flood of news about godawful air passenger experiences — various overbooking fiascos, a United passenger beaten senseless, and whatever the hell this is. 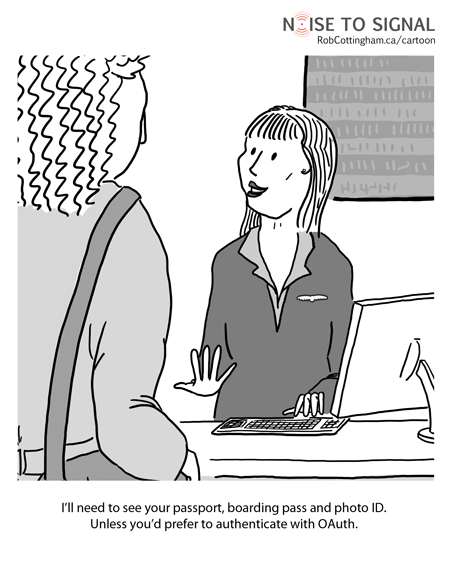 It ought to be making the airline industry think hard about customer experience. I’d love to see an airline make a declaration that they’ll never overbook again, that there’s some minimum level of passenger comfort they won’t try to pare away, and that the days of treating their customers as whiny freight are over. That they’re going to compete on the brand-new terrain of respecting their passengers. Don’t hold your breath, though. (Not that the recirculated air is that fresh to begin with.) Maybe the last several days are gamechangers for the industry, but I think it’s more likely that airline head offices are planning on riding out the turbulence on their current altitude and heading. After all, a few decades of incremental passenger abuse have made airlines one of the more profitable industries out there — especially in North America. I know, powered flight is a modern miracle, and I should spend the few hours it takes to whisk me from one coast of North America to another suffused in wonder and awe. But when I get up at 4:00 am for a 6:00 am flight, that level of presence and centeredness is a little out of reach. Even at 20,000 feet. So permit me the quintessentially First-World Problem of meh-level in-flight movies. It’s the dying moments of the Nonprofit Technology Conference in San Francisco. I’ve been cartoon-blogging like a madman – updates to follow – but in the meantime, thought I’d share a sketch from the flight down. Actually, the guy who sat next to me on the first leg of my flight was an avalanche rescue student, and we had a fascinating conversation (well, I had a fascinating conversation – his mileage probably varied, especially once I started going on about Flash restaurant menus). This was me arriving at BlogWorld on Wednesday. I’m there through Saturday, toonblogging the whole thing. You can read the latest cartoons on the BlogWorld site – and be sure to follow the #bwe10 hashtag if you’d like to read the Twitter backchannel. Okay, maybe this isn’t such a hot idea from a security standpoint. But don’t you think a little social profile vetting is in order before they seat people on an aircraft? Show me a passenger whose Twitter profile is larded up with multi-level marketing come-ons, and I’ll show you someone who’s going to pester their seat mate about exciting affiliate opportunities in the exotic berry juice industry. Check someone’s Facebook profile for a deluge of Farmville notifications and invitations, and you’ll have a pretty good idea if they’re likely to natter non-stop from LAX to LGA. And I challenge you to find a better technique than looking through someone’s commenting record on Disqus or IntenseDebate for telling whether they’re likely to hog both armrests and kick the seat of the person in front of them. 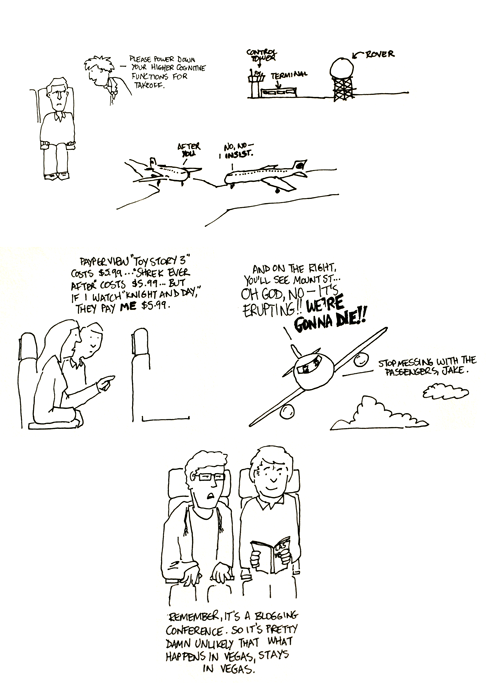 By the way, I’ll be in the air next week heading to BlogWorld in Las Vegas, sketchpad in hand. See you there? P.S. – Here’s a version just for you OAuth fans. And yep, another iPad cartoon – this one in fact drawn on a plane, on my way to lead a workshop on social media at Persuading to Win 3 in Ottawa. As much as I loved meeting my fellow presenters George Lakoff and Marc Zwelling, this is the kind of conference where at least half the enjoyment lies in seeing old faces. I got to see agenda-mates Elaine Bernard and Sean Moffitt only in passing, and a few other familiar folks from my Toronto and Ottawa days… but the greatest pleasure was spending even a few minutes with Ish Theilheimer and Kathy Eisner. Ish gave me my first full-time job out of university, and he’s been both a mentor and – along with Kathy – a good friend ever since. In lieu of a real Noise to Signal, here are some doodles from the airport. In fairness, there’s plenty to do and eat and purchase at YVR. But I was there latish, and a lot of things were closed. That said, I did not in fact get drunk – had a workshop to do on Friday, and besides, who wants to endure jet lag and a hangover?